I really don’t like the word “best” when it comes to describing food or restaurants, or much of anything else for that matter There are too many great restaurants serving great food around the world for any to be designated the best, or the 50 best. What one person might consider the best might not make the top 10 list for another person. Haven’t we all been disappointed at a restaurant recommended highly by a friend, or restaurant writer? If I had the time and resources to visit a different restaurant every night for a year I might be able to pick the 10 or 20 I liked best from that sample. But what of the hundreds of others at which I never got the chance to dine. And then there is the pool from which so-called experts make their selections. Do they have a comprehensive list of every restaurant in the world? Do they know of some of my personal favorites so they can give them a try? Or are they limiting their sample size by some pre-determined bias that probably eliminates many great restaurants from consideration. We have a rule at our sister restaurant recommendation website atlarrys.com: we do not permit the word “best” when making a recommendation. On this magazine site you will notice we have a feature called “Most Memorable Meals,” not “best” meals. So, when I saw the latest ranking of the “50 best restaurants in the world,” on CNN, I cringed. I cringe frequently when it comes to food publications. Hyperbole seems to be the number one required ingredient in cooking up each monthly edition. Magazine cover designers and editors appear unable to offer a feature called “Some Really Good New Chefs.” Instead, they give us an annual “Best New Chefs & Their Simplest Recipes.” Really? Have you visited every new chef in the world to make this determination? Isn’t it really just your opinion of the best of those you had time to sample? “Best Steak in America?” I doubt that you’ve tried them all. “Best New Chardonnays?” How drunk would you have to get to know that? If we were to prohibit the use of “best” or “ultimate,” most of these publications would have to shut down. There I was, confronted with two different “ultimate” Thanksgiving dinners, each very different from the other and from the ones offered on the cover of the previous year’s November editions of the very same magazines. Anyway, back to subject “A” – the 50 best restaurants in the world. I find a note of snobbery threaded through the list. The emphasis seems to be more on experimentation, which I personally encourage, but not at the expense of a really great pastrami sandwich or sautéed sweetbreads. Absent from the list is anything approximating a traditional meal. Osteria Francescana in Modina, Italy, is rated #1. 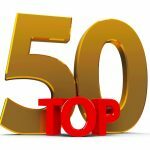 Only one U.S. restaurant makes the top 10, only three are in the top 25, and only six are in the top 50. Needless to say, I haven’t been to many of these restaurants. But there are many others at which we have dined that I would nominate as rivals for these 50. Some of the listed restaurants sound interesting enough to try. But I’m not about to go trotting around the globe in pursuit of someone’s “techno-emotional” cuisine, or the latest foam with which someone decides to decorate a dish. If I’m in the neighborhood sometime, I’ll keep these in mind. But in the meantime, I have a very extensive list of personal favorites across North America and Europe. But that will have to wait for another feature on another day.